New for the 2018-2019 school year, Save Our Shores developed a new educational model. Now with grade-level specific, NGSS-aligned curriculum, our educational programming is designed to fit flawlessly into teachers’ academic year. Contact us now to learn about scheduling your free experiences with Save Our Shores for the 2019-2020 year! Each grade experience includes two classroom visits and one beach field trip. The first visit explores a theme related to the healthy habitats of Monterey Bay. The following field trip takes students to a local beach and engages them in exploration to deepen their understanding of ocean literacy concepts. The final visit ties it all together with a culminating project. Our science, technology, engineering, and math (STEM) programs help students discover their connection with the bay, build healthy eco-identities, and become environmental stewards of our coasts and ocean. Our Spring 2019 educational program calendar is currently full. For additional information or to inquire about future opportunities, please contact us at education@saveourshores.org. Need data cards for your class? 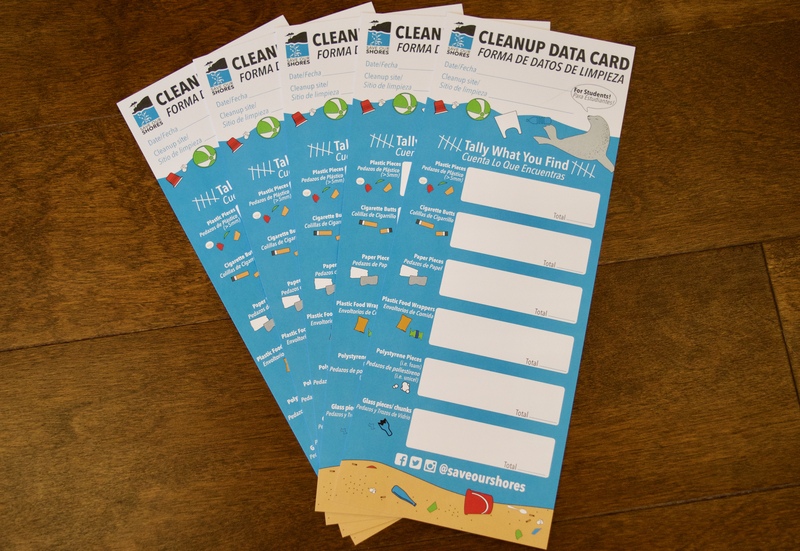 You can print and use the PDF of our data collection tool for your next cleanup! Phenomenon: There are many different kinds of kinds of living things at the beach. Guiding Question: What are beach and ocean habitats and how can we protect them? In their schoolyard and at the beach, students observe and ask questions about living things. They develop an understanding of local habitats—where animals and plants find what they need to live—by making and labeling drawings in a science notebook. Then, students read about and discuss how human debris can affect beach and ocean habitats and how people can take actions to protect those habitats. Phenomenon: There’s trash in my community! Guiding Question: How do we prevent litter? Through games and citizen science investigations, students investigate ways debris and pollutants move through a watershed and gather data about types of litter in their community. At the beach, students play a Recycle Relay game, identifying which materials can be recycled or reused and which materials must go the landfill/trash. They engage in an ocean stewardship beach cleanup, organizing collected trash to compare and contrast its properties. Lastly, students explore waste reduction strategies and communicate about which prevention strategies apply to different materials. Phenomenon: Sometimes, wild animals need help. Guiding Question: How can I help animals in Monterey Bay? Students explore organisms that populate the Monterey Bay National Marine Sanctuary. They make connections between the organisms’ features and characteristics, and their ability to survive in their habitat. At the beach, a game exploring animal migration and a beach cleanup help students discover ways plastics pollution changes the marine environment and affects organisms’ ability to survive. Students create a presentation about ways to help protect marine life locally. Phenomenon: Humans change the world around them and the world changes around humans. Guiding Question: How can humans live near beaches that change over time? Students observe maps of the California and the Monterey Bay, comparing underwater features with land features. They create a visual model the geographic profile of the region, with a focus on their school’s position within the Pajaro River Watershed. Students explore a local beach and develop ideas about how to protect coastal areas from potential natural hazards. Lastly, teams build physical models of their proposed solution, and share it with the class. Phenomenon: Animals and plants are connected in Monterey Bay, but may struggle in the face of pollution. Guiding Question: Why is Monterey Bay home to so many animals? 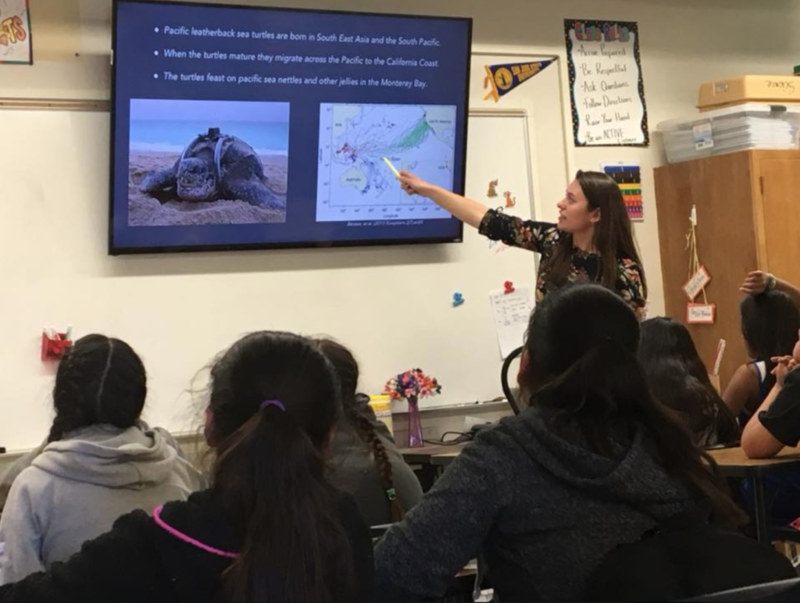 Students learn about some of the species in the Monterey Bay that are connected by a complex food web. They create a visual model of the web. Then, as they consider the flow of energy from the sun and the roles of plankton and decomposition, they refine their model. At the beach they play a game and conduct a cleanup, discussing ideas about how plastics pollution affects the marine food web and interrupts the flow of energy. Working in pairs, students design a solution to this problem. Phenomenon: There’s litter on the ground and I don’t know where it came from. Guiding Question: How does litter get moved around? Students make observations of the weather and are introduced to the water cycle. They gather information about and create a visual model representing the water cycle, showing the movement of water, and debris along with it, through a watershed. In a beach cleanup activity, students collect and analyze data about marine debris. They play a Recycle Relay game to better understand what happens to different waste products. Finally, they design a method for monitoring and minimizing human-generated litter on the environment. Available now! Description coming soon. Other ages and youth groups may also be served. We may not be able to offer busing for programs outside of Monterey Bay. Please feel free to contact us for a customized program.